Box of 100 Corn Broom. Fantasy Style. 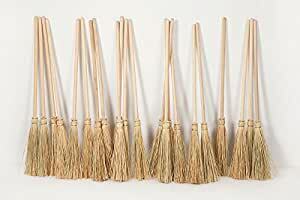 Box of 100 fantasy broom style. Light broom, with genuine pine wood stick . A very elegant finish and handcrafted style. Good quality. Approx. 43″. Exclusive in Amazon. Deliveries in 5-7 days in US. Box of 100 Fantasy Broom style. Good quality. Approx. 41-43″. The natural fiber does not break alone, only if it forces the part of the wire. Made in Spain Upon Request. Handmade for Artisan “Mendi” Deliveries in 5-7 days in US. You must provide your identification number to fill out the delivery data.